We speak to Australian Muscle Car magazine editor Luke West, about the 100th issue of this proudly Australian publication - dedicated to preserving the legend of our unique ‘Australian made’ Ford vs Holden muscle car heritage. Can you describe Australian Muscle Car magazine? Who is it for and what does it cover? AMC is all about the biggest moments in Aussie motor racing history – like Allan Moffat’s 1-2 at Bathurst in 1977 or Peter Brock’s six-lap victory in his A9X Torana. It’s about the stars, their racecars and the behind-the-scenes stories. The magazine is also about the high-performance road cars the Aussie manufacturers built and sold to the public. Our readers are best described as blokes who became rusted-on car magazine buyers as teenagers. So it tends to be an older readership. Broadly speaking, these chaps break down into three groups: those primarily interested in road-going muscle cars; those primarily interested in motor racing history; and those who love to read about both. It’s my job to give them the type of content they can’t get elsewhere these days. That includes long-form feature articles. Like many of the cars on our pages, AMC is a truly unique beast. What’s the best part of being the editor of Australian Muscle Car magazine? Putting my fan-boy hat on, it’s getting to meet the legends and household names then learning what makes them tick. As a writer, it’s telling previously untold stories or shedding new light on moments in history. And as an editor, it’s the challenge of finding and bringing to life new content in what’s a pretty narrow niche. How did that ‘fan-boy’ you mentioned get his dream job? What’s your background? I’ve followed motorsport all of my life, having fallen in love with racing when I was taken to Amaroo Park as a youngster. I started my working life as a school teacher, before branching out and turning my passion for cars into a career. I worked in automotive PR for a spell, then freelanced for motor racing magazines, while also working as a track announcer at V8 Supercars races. One of the mags I contributed to was AMC, so when founding editor Mark Oastler pulled up stumps he put my name forward to the publishers and in 2011 I slid into the editor’s chair. Our milestone 100th issue is my 47th as editor. Yikes! What’s your favourite article featured in the 100th issue? When I landed in this role seven years ago, I was determined to nail down noted racing reclusive Norm Beechey for an interview. Norm was a racing great of the 1960s and early 1970s, but since retiring 45 years ago has refused to give in-depth interviews. He politely knocked me back in 2011, but I was determined to eventually get my man – it was just about finding the right avenue and approach. So for issue #100 to include an exclusive interview and profile befitting the landmark issue is very satisfying. We lead the story with how we actually got Norm over the line. What is the most expensive car you have featured in Australian Muscle Car magazine? It would have to be one of the iconic racecars driven to victory at Bathurst by one of the greats. These are million dollar-plus machines. As to a road car, the 1971 Ford Falcon GT-HO Phase III generally brings top dollar at auctions – the best examples are worth $500,000 or more. Not bad for a car that sold for less than $5000 when new. Who do you think will be the winner of Bathurst 1000 this year? That’s almost as difficult to predict as what the future holds for the Bathurst 1000 given how much the Australian automotive landscape has changed in the last few years. Traditional rivals Holden and Ford have both pulled down the shutters on manufacturing cars in this country, so we’re entering a very uncertain time for those marques and also for the Great Race. If you could own any muscle car in the world what would it be and why? I have a soft spot for the 1971 Chrysler VH Pacer – which is a four-door sedan built at Chrysler’s old factory in Adelaide – as it was completely overshadowed back in the day (and now) by its more famous brother, the legendary Charger, which is a two-door coupe. Because the VH Pacer flies under the radar its possibly – hopefully! – falls into my price range. I’m also embarking on a bit of a quest to find a survivor from the first Bathurst classic, in 1963. I’d love to own an ex-Bathurst 500 or 1000 racecar. I wish I’d taken the advice of the very first issue of Australian Muscle Car in 2001 which named six classics you could own for less than $20K. A 1968 HK Monaro GTS 327 was valued at approximately $19,000 when the mag started. It brings a tear to the eye to note that a GTS 327 sold at auction late in 2017 for $200,000! For issue #100’s cover story we’ve identified the modern classics that future generations will lust after. Take note! 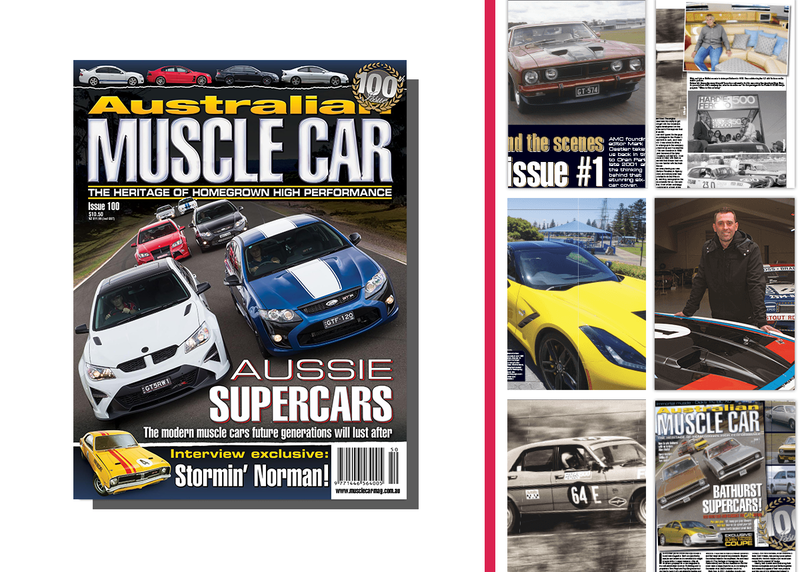 What can readers expect from future issues of Australian Muscle Car? We’ve got a ripper cover story in the can for issue #101 on a car that was stored away virtually untouched for over 40 years after it was pulled of the racetrack in the early 1970s. It’s a real time capsule – dust, rust and all. We won’t be changing the formula anytime soon. One story that worked a treat in 2017 was a largely pictorial feature where Allan Moffat kindly took us through his scrapbooks and paperwork from his stellar 1977 season. The readers gobbled it up, so I’d like to do more of this style of feature. If Australian Muscle Car had a motto what would it be? Our tagline on the cover is ‘The Heritage of Homegrown High-Performance’. It’s a more accurate description of the territory we cover than our very specific title. We feature more than just what would be most people’s mental image of a ‘muscle car’.